Objective Asymptomatic intracranial hemorrhage (aSICH) is a common phenomenon after endovascular treatment of acute ischemic stroke, but its prognostic impacts remain unclear. This study evaluated functional outcomes of thrombectomy in patients with and without aSICH. Methods Patients with acute ischemic stroke due to large artery occlusion in the anterior circulation who were treated with thrombectomy were enrolled in 21 centers. According to CT scans performed within 72 hours of endovascular procedures, patients with aSICH or without intracranial hemorrhage were included while patients with symptomatic intracranial hemorrhage (SICH) were excluded. Baseline data and functional outcomes were compared between patients with aSICH and those without intracranial hemorrhage. Logistic regression analysis was applied to evaluate the impacts of aSICH on functional outcomes. Results Of the 632 patients with endovascular treatment, 101 (16.0%) were classified as having SICH, 212 (33.5%) as having aSICH, and 319 (50.5%) as being without intracranial hemorrhage. Patients with aSICH after endovascular treatment had a lower ratio of excellent outcome (mRS 0–1, OR 0.53; 95% CI 0.33 to 0.84, P=0.007) than those without intracranial hemorrhage. There were no significant differences concerning favorable outcome (mRS 0–2, OR 0.76; 95% CI 0.50 to 1.14, P=0.185) or mortality (OR 0.64; 95% CI 0.38 to 1.09, P=0.101) between patients with aSICH and those without intracranial hemorrhage. Conclusions In an Asian population, aSICH after thrombectomy may decrease the likelihood of an excellent functional outcome but does not influence a favorable outcome and mortality in patients with ischemic stroke due to large artery occlusion in the anterior circulation. Intra-arterial thrombectomy has transformed ischemic stroke from a therapeutic nihilism to a treatable condition.1 2 As a common complication, intracranial hemorrhage (ICH) after endovascular treatment is usually classified as symptomatic or asymptomatic according to clinical relevance.3 Symptomatic intracranial hemorrhage (SICH) has been reported with negative impacts on functional outcomes in stroke patients with thrombectomy.4–6 However, asymptomatic intracranial hemorrhage (aSICH) has been reported to have varied or even contrary effects on functional outcomes.7–10 Using the widely accepted Heidelberg Bleeding Classification,11 this study evaluated the impact of aSICH after endovascular treatment on the 90-day functional outcomes in patients with acute ischemic stroke due to large artery occlusion in the anterior circulation. Endovascular treatment was usually programmed if patients: (1) were adults (18 years or older); (2) were identified with ischemic stroke due to a large artery occlusion in the anterior circulation; (3) had a premorbid modified Rankin scale (mRS) score <2 before the stroke; (4) had a pretreatment NIH Stroke Scale (NIHSS) score >5; and (5) could be treated with thrombectomy within 6 hours after stroke onset. Endovascular treatment was still performed based on obvious ischemic penumbra for some selected patients who did not meet the above criteria. Endovascular treatment was usually stopped if patients: (1) had evidence of concomitant ICH; (2) had large infarct cores as indicated by an Alberta Stroke Program Early CT (ASPECT) score <6 based on CT scan; or (3) had untreated concomitant aneurysm or arteriovenous malformation. Patients who were treated with intra-arterial thrombolysis alone or treated with thrombectomy with devices other than stent retrievers were also excluded from this study. Non-contrast cranial CT was performed in each patient to exclude any ICH before endovascular treatment. CT angiography (CTA), magnetic resonance angiography (MRA), or digital subtraction angiography (DSA) was performed to confirm large artery occlusion in the anterior circulation as the cause of the current stroke. Patients were treated following the guidelines for acute ischemic stroke.14–16 Endovascular treatment was usually accomplished with a stent retriever (Solitaire, Covidien, Irvine, California, USA). Intravenous thrombolysis was recommended if a recombinant tissue plasminogen activator (rtPA) bolus could be initiated within 4.5 hours of stroke onset, given the patients met the criteria. Thrombectomy was performed in selected patients, especially in those with large thrombus burden without intavenous thrombolysis. Successful recanalization was defined as grade 2b or 3 on the modified Thrombolysis in Cerebral Infarction (mTICI) score.17 For patients who did not achieve successful recanalization, rescue therapies including balloon angioplasty, stent deployment, intra-arterial thrombolysis, or intra-catheter tirofiban administration may be applied. A CT scan was usually performed 24–72 hours after each thrombectomy procedure. Extra CT scans were performed whenever an ICH was indicated by clinical symptoms. Collateral status was assessed by the American Society of Interventional and Therapeutic Neuroradiology/Society of Interventional Radiology (ASITN/SIR) grading on DSA, ranging from grade 0 (no collateral) to grade 4 (complete and rapid collateral perfusion to the ischemic areas).18 Image results were reviewed by two experienced neurologists (YH and HW) who were blinded to the clinical outcomes. In case of disagreement, advice from a third neurologist was invited. (A) CT with hemorrhagic infarction (HI) type 1 of left basal ganglia and temporal lobe. (B) CT with HI type 2 of right striatum. (C) CT with parenchymal hematoma (PH) type 1 in the left temporal lobe. (D) CT with extended PH type 2 of the right middle cerebral artery territory and mass effect causing a shift of midline structures to the left. Continuous variables were analyzed with the Student’s t-test or Mann–Whitney U test. Categorical or ordinal variables were analyzed with the χ2 or Fisher exact test. Univariate analysis was followed by multivariable analysis based on variables with at least marginal significance (P<0.10) and those being associated with functional outcome in previous studies. Two-tailed P values of <0.05 were considered statistically significant. Statistical analyses were performed using SPSS 22.0 software (IBM, Armonk, New York, USA). A total of 632 patients with ischemic stroke treated with endovascular procedures were included in this study. ICH was identified in 313 (49.5%) patients within 72 hours of endovascular treatment. According to the Heidelberg Bleeding Classification, 101 patients (16.0%) were diagnosed with SICH, 212 (33.5%) with aSICH, and 319 (50.5%) without ICH. As shown in table 1, patients with aSICH had higher levels of baseline serum glucose than patients without ICH (median 6.89 vs 6.52; P=0.043). The proportion of ICA occlusion was higher in patients with aSICH (47.6% vs 29.8%; P<0.001). Patients with aSICH had a higher pretreatment NIHSS score than those without ICH (median 17 vs 16; P=0.002). As shown in figure 2, there were no significant differences concerning mortality at 90 days between patients with aSICH and those without ICH (18.4% vs 19.1%, P=0.834). The proportions of patients with excellent outcomes (mRS score 0 or 1) at 90 days was lower in patients with aSICH than in those without ICH (19.8% vs 37.9%, P<0.001). The proportions of patients with favorable outcomes (mRS score of 0, 1, or 2) at 90 days was lower in patients with aSICH than in those without ICH (43.9% vs 56.1%, P=0.006). 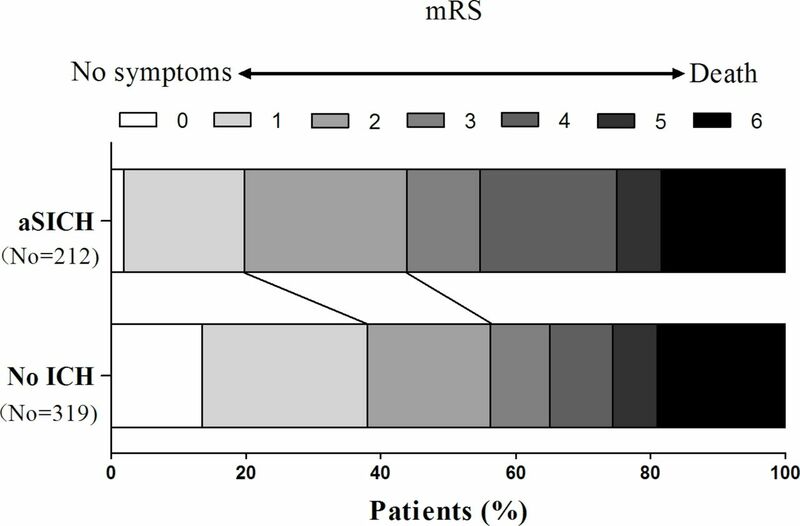 Distribution of modified Rankin Scale (mRS) scores at 90 days according to the presence of asymptomatic intracranial hemorrhage (aSICH). Ratios were compared with the Mann–Whitney U test (P=0.001). Fewer patients with aSICH reached an excellent outcome (mRS score 0 or 1) at 90 days after the index stroke than patients without ICH (19.8% vs 37.9%, P<0.001). Multivariate analysis was performed to detect potential predictors for an excellent outcome, favorable outcome, and mortality (table 2). After adjusting for potential influential factors, diabetes mellitus, atrial fibrillation, baseline serum glucose, baseline NIHSS, stroke etiology and occlusion site were associated with excellent outcomes (online supplementary material). Notably, aSICH was negatively associated with an excellent outcome (OR 0.53; 95% CI 0.33 to 0.84, P=0.007) but not with a favorable outcome (OR 0.76; 95% CI 0.50 to 1.14, P=0.185) or mortality (OR 0.64; 95% CI 0.38 to 1.09, P=0.101). Impacts of aSICH on functional outcomes in multivariate model. In this multicenter registry study we observed that patients with aSICH after endovascular treatment had a lower ratio of excellent outcome (OR 0.53; 95% CI 0.33 to 0.84, P=0.007) compared with patients without ICH. The proportion of patients with aSICH after endovascular treatment in this study (33.5%) was higher than that reported in the Thrombectomy within 8 hours after Symptom Onset in Ischemic Stroke (REVASCAT) trial (19.5%),21 was similar to that reported in the Randomized Assessment of Rapid Endovascular Treatment of Ischemic Stroke (ESCAPE) trial (36.4%),22 and was lower than that reported in the Mechanical Thrombectomy after Intravenous Alteplase versus Alteplase Alone after Stroke (THRACE) trial (44.1%).23 A recent meta-analysis indicated that endovascular treatments may increase the risk of aSICH compared with medical treatment (28.0% vs 13.9%, OR 3.16; 95% CI 1.62 to 6.16).24 During or after endovascular treatment, ICH may result from mechanical damage of the vessel wall, reperfusion lesion, and increased blood–brain barrier permeability. Intracranial atherosclerosis is more prevalent in Asian patients,25 which may present an obstacle to the guidewire or retriever reaching and passing through the target occlusions. Multiple passing attempts may increase the risk of ICH and cause a deterioration in the functional outcomes. Several limitations should be addressed when interpreting the results of the present study. As a registry study, the data were collected retrospectively and the involved centers may have applied varying criteria for endovascular treatment. Anticoagulation and antiplatelet treatments were not analyzed, both of which may influence the risk of ICH. Further longitudinal studies including these confounding variables are warranted. All patients in this study were of Asian ethnicity, so the findings may not be generalizable to other populations. In Asian populations, aSICH after thrombectomy may decrease the likelihood of an excellent functional outcome but does not influence favorable outcome and mortality at 90 days in patients with ischemic stroke due to large artery occlusion in the anterior circulation. YH and WL contributed equally. Contributors YH, WL: Drafting the work, revising it critically for important intellectual content and substantial contributions to the conception and design of the work; acquisition, analysis, and interpretation of data for the work. HW, WZ, DY, WW, XT, FG, PJ, YX: Substantial contributions to the conception and design of the work; acquisition, analysis, and interpretation of data for the work. XL: Agreement to be accountable for all aspects of the work in ensuring that questions related to the accuracy or integrity of any part of the work are appropriately investigated and resolved. GX: Final approval of the version to be published and agreement to be accountable for all aspects of the work in ensuring that questions related to the accuracy or integrity of any part of the work are appropriately investigated and resolved. Funding This work was partly supported by National Natural Science Foundation of China (No. 81530038, 81220108008, 81400898, 81400993, 81571143 and 81671172), Jiangsu Provincial Special Program of Medical Science (No. BL2013025) and Chinese Postdoctoral Science Fund (No. 2015M572815). Ethics approval The study was approved by the local ethic committees of the included centers. Collaborators ACTUAL investigators: Xinfeng Liu, Gelin Xu, Yunyun Xiong, Wenjie Zi, Dong Yang, Huaiming Wang, Yonggang Hao, Department of Neurology, Jinling Hospital, Medical School of Nanjing University, Second Military Medical University, Southern Medical University, Nanjing, China; Meng Zhang, Chengchun Liu, Department of Neurology, Research Institute of Surgery, Daping Hospital, Third Military Medical University; Yu Geng, Zongjie Shi, Jinhua Zhang, Department of Neurology, Zhejiang Provincial People’s Hospital; Hang Lin, Min Lin, Zhen Hu, Department of Neurology, Fuzhou General Hospital of Nanjing Military Region; Xiaorong Deng, Yue Wan, Department of Neurology, Hubei Zhongshan Hospital; Jiandong Zhang, Zhonghua Shi, Mirui Qu, Department of Neurosurgery, the 101st Hospital of the People’s Liberation Army; Zhiming Zhou, Xianjun Huang, Department of Neurology, Yijishan Hospital of Wannan Medical College; Wei Wang, Department of Radiology, the First People’s Hospital of Yangzhou, Yangzhou University; Haowen Xu, Tao Quan, Sheng Guan, Department of Neurology, the First Affiliated Hospital of Zhengzhou University; Xiguang Tian, Lin Chen, Department of Neurology, the Chinese Armed Police Force Guangdong Armed Police Corps Hospital; Penghua Lv, Xiaobo Li, Department of Neurology, Northern Jiangsu People’s Hospital; Shuiping Wang, Shiquan Yang, Department of Neurology, the 123rd Hospital of the People’s Liberation Army; Wenhua Liu, Dan Wei, Department of Neurology, Wuhan No.1 Hospital; Zhen Wang, Department of Neurology, Changsha Central Hospital; Xintong Liu, Department of Neurology, Guangdong Provincial No.2 People’s Hospital; Fuqiang Guo, Shu Yang, Department of Neurology, Sichuan Provincial People’s Hospital; Dequan Zheng, Xinyu Wu, Youfu Zeng, Department of Neurology, the 175th Hospital of the People’s Liberation Army, the Affiliated Southeast Hospital of Xiamen University; Mingyi Tu, Department of Neurology, Hubei Wuchang Hospital; Ping Jin, Yong Liu, Department of Neurology, Lu’an Affiliated Hospital of Anhui Medical University; Hua Li, Jiayang Fang, Department of Neurology, 476th Hospital of the People’s Liberation Army; Guodong Xiao, Department of Neurology, the Second Affiliated Hospital of Soochow University.